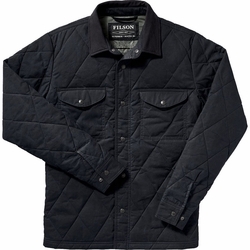 Filson Hyder Quilted Jac-Shirt. Stay warm and dry in Filson's Hyder Quilted Jac-Shirt. A midweight 4-oz. cotton shell with dry wax finish offers the weight of a shirt with the water-resistant performance of a jacket. Ultralight PrimaLoft Silver Echo 100g insulation provides warmth through cold seasons. The snap-close front is easy to operate while wearing gloves.